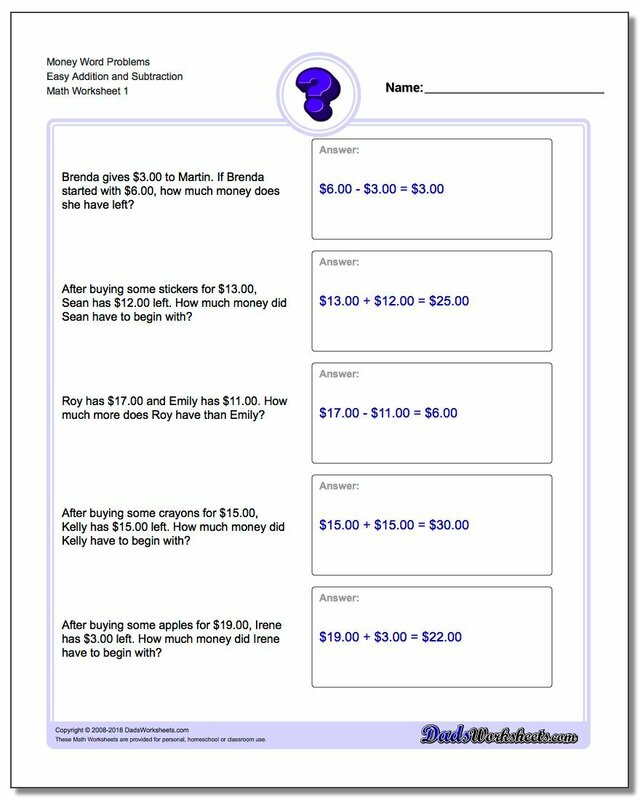 These money word problems worksheets engage students with real world problems and applications of math skills. The problems are grouped by addition and subtraction (appropriate for second or third grade students), or multiplication and division (appropriate for fourth or fifth grade students who have mastered decimal division), or combinations of all four operations. 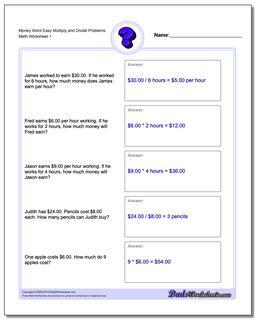 Click one of the buttons below to view the individual worksheets in each set. Addition and subtraction word problems for money. Mixed operation word problems with money. Addition and subtraction word problems for money with extra unused facts in the problem. 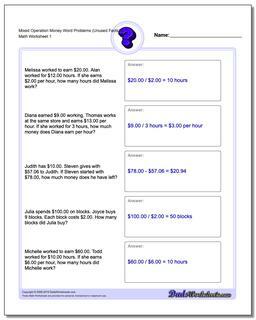 Word problems for money multiplication and division with extra unused facts in the problem. 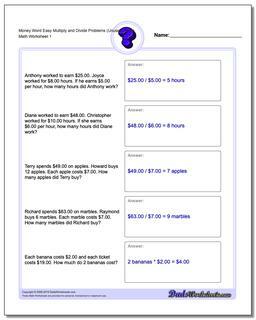 Mixed operation word problems with money with extra unused facts in the problem. Money is a powerful and familiar application of basic math operations, and the money story problem worksheets on this page are perfect for grade school age children to start putting their basic arithmetic skills to work. 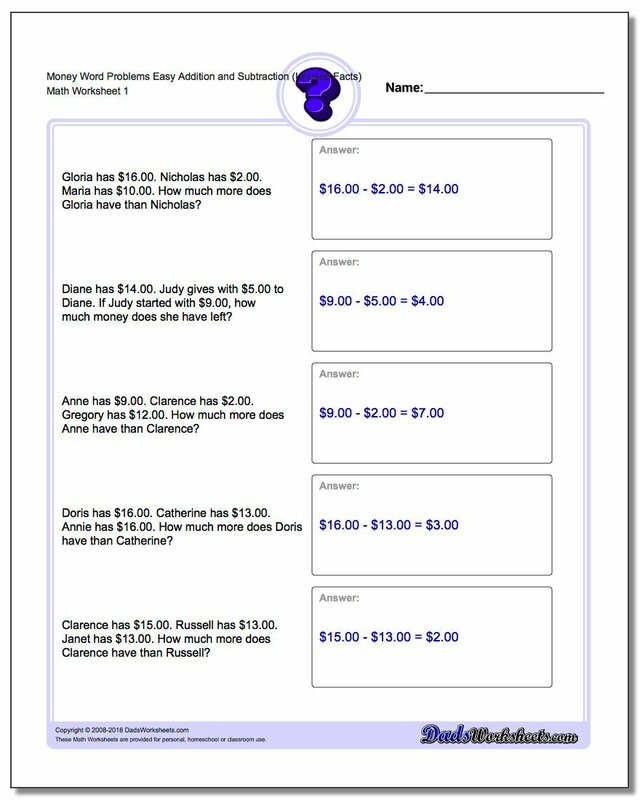 The worksheets start with sets that have exactly the information needed to solve particular money word problems, but an important skill is to learn to identfy excess or unused facts in the problem description. Because money problems in the real world appear in the context of lots of information you may not need to solve a problem, recognizing what information is important is often as critical a skill as being able to do the basic arithmetic. 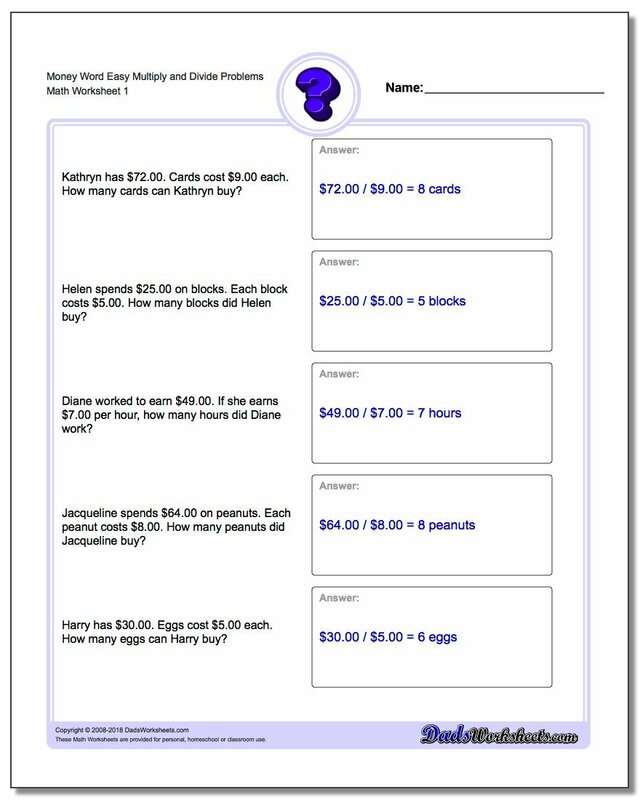 The money word problems worksheets marked as having 'extra facts' on this page are appropriate for 3rd or 4th grade students who can confidently solve other problems. The word problems are grouped into sets focusing on addition and subtraction, or multiplication and division, or combinations of all four operations. 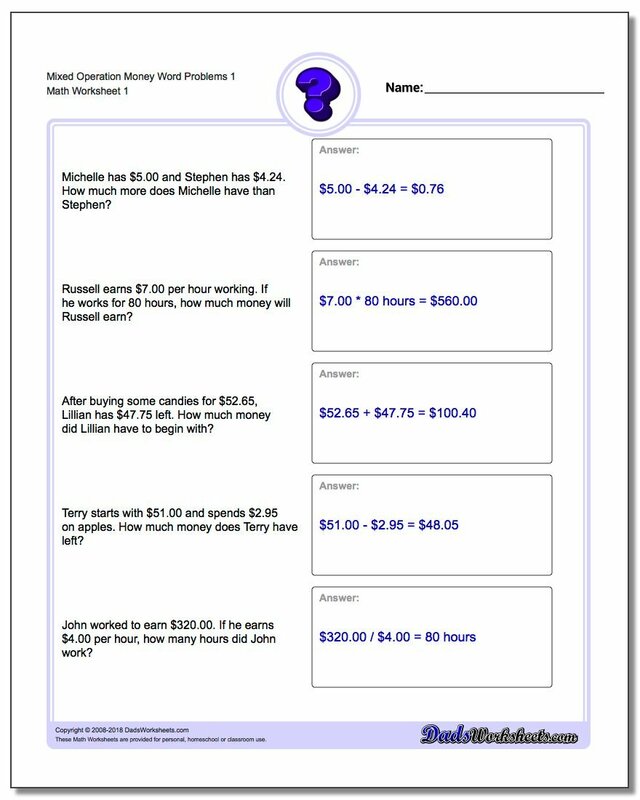 If you are learning basic math facts, worksheets appropriate to the operations you are working on may help solidify concepts and can be used alongside math fact practice for extra support. 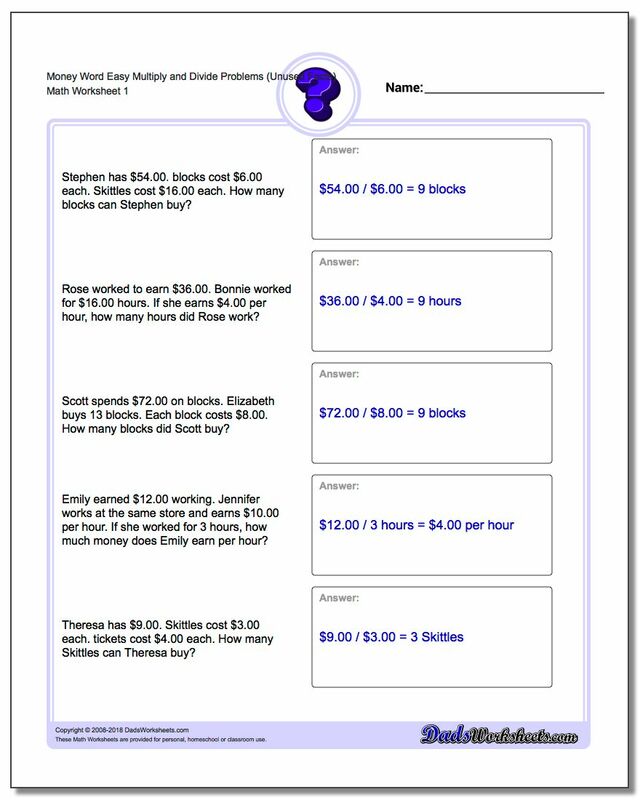 Because these are all money story problems, they typically involve both dollars and cents, so students will need some familiarity with decimal arithmetic to solve them. 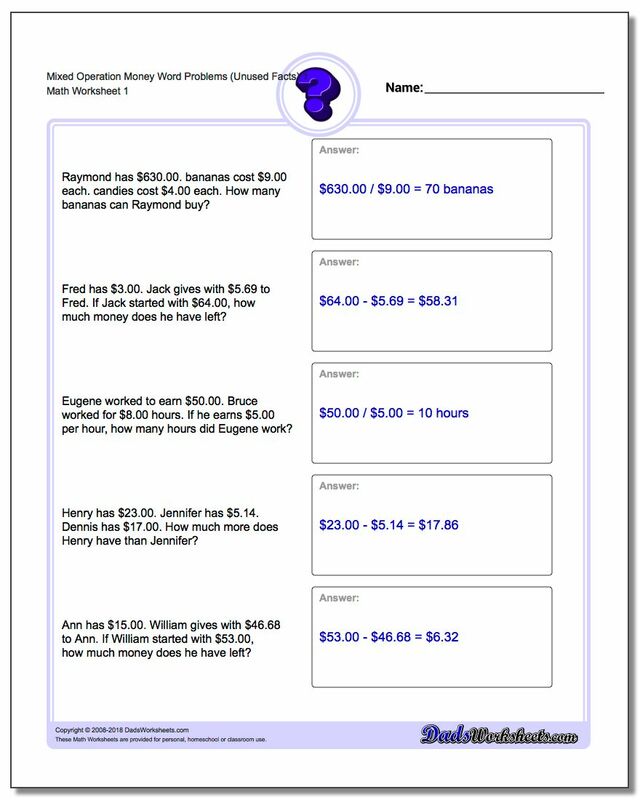 For a visual introduction to money, check out the Money Worksheets page, which includesMaking Change and a really nice set of Printable Play Money that can be a great manipulative aid when solving money word problems and more!